March 22 is the 81st day of the year(82nd in leap years) in the Gregorian calendar.There are 284 days remaining until the end of the year. 1972 – In Eisenstadt v. Baird , the United States Supreme Court decides that unmarried persons have the right to possess contraceptives. Gordian I was Roman Emperor for 21 days with his son Gordian II in 238, the Year of the Six Emperors. Caught up in a rebellion against the Emperor Maximinus Thrax, he was defeated by forces loyal to Maximinus, and he committed suicide after the death of his son. Gordian II was Roman Emperor for 21 days with his father Gordian I in 238, the Year of the Six Emperors. Seeking to overthrow Emperor Maximinus Thrax, he died in battle outside Carthage. Since he died before his father, Gordian II had the shortest reign of any Roman Emperor in the whole of the Empire's history, at 21 days. Bernard Plantapilosa or Bernard II of Auvergne, or Plantevelue, son of Bernard of Septimania and Dhuoda, was the Count of Auvergne from 872 to his death. The Emperor Charles the Fat granted him the title of Margrave of Aquitaine in 885. 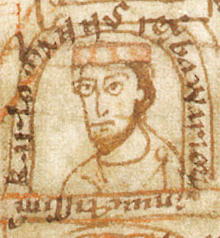 Bernardof Septimania (795–844), son of William of Gellone, was the Frankish Duke of Septimania and Count of Barcelona from 826 to 832 and again from 835 to his execution. He was also count of Carcassonne from 837. He was appointed to succeed his fellow Frank Rampon. During his career, he was one of the closest counsellors of the Emperor Louis the Pious, a leading proponent of the war against the Moors, and opponent of the interests of the local Visigothic nobility. Year 1144 (MCXLIV) was a leap year starting on Saturday of the Julian calendar. Saint Darerca of Ireland was a sister of Saint Patrick. Epaphroditus is a New Testament figure appearing as an envoy of the Philippian and Colossian church to assist the Apostle Paul. He is regarded as a saint of the Orthodox Church and the Catholic Church, first Bishop of Philippi, and of Andriaca, and first Bishop of Terracina, Italy. There is little evidence that these were all the same man. Clemens August Graf von Galen was a German count, Bishop of Münster, and cardinal of the Roman Catholic Church. During World War II, Galen led Catholic protest against Nazi euthanasia and denounced Gestapo lawlessness and the persecution of the church. He was appointed a Cardinal by Pope Pius XII in 1946. He was beatified by Pope Benedict XVI in 2005. ↑ "Ghana bus crash: Dozens killed after two buses collide in Bono East". BBC News. 22 March 2019. Retrieved 2019-03-24. ↑ "BBC - History - Historic Figures: Caroline Norton (1808 - 1877)". www.bbc.co.uk. Retrieved 2019-01-29. Wikimedia Commons has media related to March 22 .